"Dusting for prints" has been a mainstay of forensic investigations since the late 1880's—employing a developer powder to add enough contrast for the fingerprint to show up in photographs. But what about latent prints or those on visually dense, multi-color surfaces? The Crime-lite ASV System can image them—with infrared lasers. 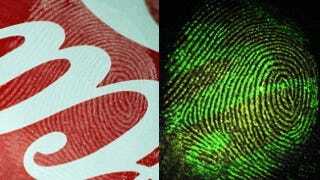 A latent fingerprint refers to any print that is left via a chance encounter with objects. They are usually only partial prints—not of the full digit—and typically "contain less clarity, less content, and less undistorted information than a fingerprint taken under controlled conditions, and much, much less detail compared to the actual patterns of ridges and grooves of a finger." The prints could come from a person's sweat or really any other material—blood, oil, paint, what-have-you. They might not even be in the visible spectrum, but if the print exists, this system will see it. The Crime-Lite ASV employs the Raman effect to visualize the evidence, which is named after the Nobel-winning Indian researcher, Sir Chandrasekhara Venkata Raman, who first discovered the effect in liquids back in 1928. Basically, when photons strike another molecule, most of the photons simply bounce off or elastically scatter with the same amount of energy and wavelength as they did before the collision. No harm, no foul, right? But, a very small proportion (roughly 1 in 10 million) of the photons scatter via excitation—they lose a small amount of energy when they bounce. It's this lowering of the transitional energy (known as Anti-Stokes scattering) that forensic researchers look for. The Crime-Lite system itself is a tabletop device 510mm x 425mm x 250mm (approximately 20in x 17in x 10in). It uses a dusting powder like traditional techniques except that this powder exploits Anti-Stokes effects. Instead of powders that absorb light from the visible spectrum and simply add contrast, these Anti-Stokes powders absorb invisible infrared light and converts it to shorter wavelengths that can the human eye can discern. This technique, as you can see in the top image, virtually eliminates the background image leaving only the print itself visible. It's essentially the reverse of normal fluorescence—instead of making the print itself "brighter," this system makes everything else "darker."